This item can charge iPhone series, including iPhone 4, iPhone4s, iPhone 5, iPhone 5C,iPhone 5S, iPhone 6, iPhone 6 plus, iPhone6S, iPhone 6splus, iPhone 7, iPhone 7plus, iphone8. Also, it can work with HTC, Nexus, LG and most Android cell phone. Our Chip can identify your device automatically and provide the proper current to your device. 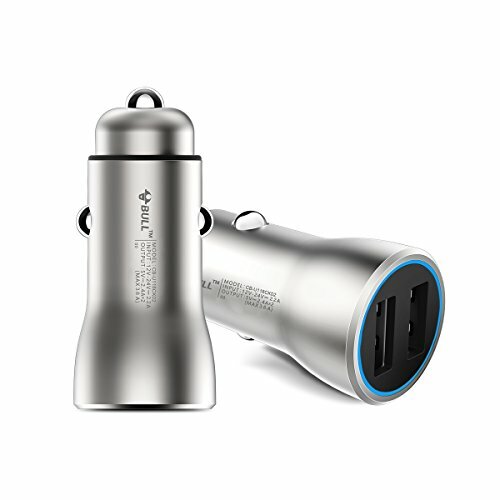 BULL/GN: The car charger is designed by Bull Group that consists of hundreds of designers and engineers. It is famous for excellent quality for 20 yrs! 2.Safety technology- the advanced chip will cut off the electricity to prevent your cell phone from over-charging and give your battery a longer working life. Also, we use a high-tech brass layer to make sure your charger will never be too hot to touch. 3.Dual smart USB ports- quickly and easily identify your mobile devices-can work with iphone series and Android phones- to provide optimal charging efficiency. With double ports, you can charge you and your passenger's devices at the same time. 4. Fashionable and solid design -Germany IF Design Award Winner, the copper body, and the blue Led ring, present the combination of function and art. It is never easy to fall apart. 5.What Bull can offer: quick, professional, friendly service to all the customers with a 30-day Money-back and 18-month Quality Warranty. Fortune 30W Car Charger with Quick Charge 3.0 Integrated 6 Ft Micro USB Cable & 2.4A Port for Android Mobiles: Samsung Galaxy S9 S8 S7 Edge Plus Note Nexus, HP, HTC, LG, Motorola, Zenfone Etc.